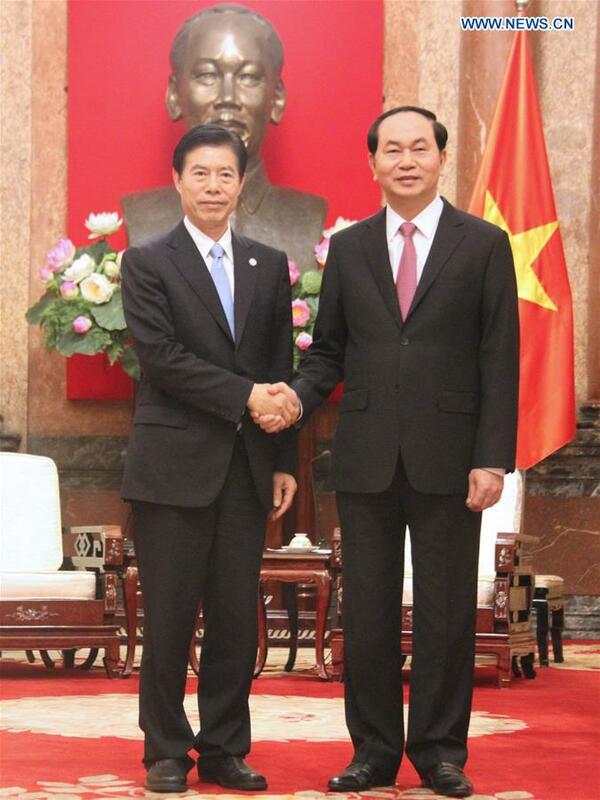 HANOI, May 21 (Xinhua) -- China highly appreciates Vietnam's active support and participation in the Belt and Road Forum for International Cooperation held recently in Beijing, and the achievements gained at the summit, Chinese Minister of Commerce Zhong Shan has said. Zhong Shan made the remarks on Saturday while meeting Vietnamese President Tran Dai Quang on the sidelines of the 23rd APEC (Asia-Pacific Economic Cooperation) Ministers Responsible for Trade Meeting held in Hanoi from Saturday to Sunday. The Belt and Road Forum for International Cooperation attained comprehensive success and fruitful results, said Zhong. The Silk Road spirit of peace and cooperation, openness and inclusiveness, mutual learning and mutual benefit has won applause and positive support from participants and the international community, including Vietnam, said Zhong. As the largest trade partner of Vietnam for years, China will further implement the consensus agreed by leaders of both sides, pushing forward the connectivity of the Belt and Road Initiative and Vietnam's Two Corridors and One Circle plan, as well as the construction of cross-border economic zone, said Zhong, adding that China will fully support Vietnam in hosting APEC's 2017 summit. Tran Dai Quang, for his part, congratulated China's success in holding the Forum, adding that the country attaches great importance to broadening and deepening economic, trade and investment relations with China. Vietnam is willing to take all measures to strengthen and deepen the comprehensive strategic cooperation partnership with China, said Quang, wishing to coordinate with China further to host the APEC summit and its related meetings.